I grew up surrounded by the smells of plethora of Newah dishes, often prepared just for everyday meals. But I lacked passion for food or had any desire of engaging in elaborate Newari cooking. Being the eldest expat family in the United States, many frequented my home – often expecting a home cooked meal. This compelled me to cook dishes from my childhood. Slowly as my cooking evolved, I began adapting Newah cuisine from my childhood to my American-Nepali meals. Newah Bhoye (Bhoj) is an iconic feast celebrating intimate family gatherings to lavish big weddings. Newars of the Kathmandu valley are known for their love of good food. There is even a running joke in Nepal that goes like “others ethnic groups may ruin themselves with polygamy, but Newars would ruin themselves just by feasting”. Newah Bhoye showcases Newah culture’s deep relationship with its food. In the recent years, many Nepalese immigrated to the west, which forced them to exchange their traditional food with items from dollar menu. As a Newah immigrant, I can only reminiscent days of Bhoye, when I accompanied my family to a wedding Bhoye of my older cousin, or Bhoye celebrating Yenyaye puni (Indra Jatra), or one during Mohani (Dashain). Many Newars in Kathmandu valley still prepare Bhoye during traditional festivities, despite the demands of modern day lifestyle, and growing homogenization of the culture. However, this Bhoye culture is slowly getting lost somewhere between a newly opened KFC and microwavable dinner from Bhat Bhateni. Bhoye is feasted while sitting down in a long line on a hand woven paddy straw mat on the floor. 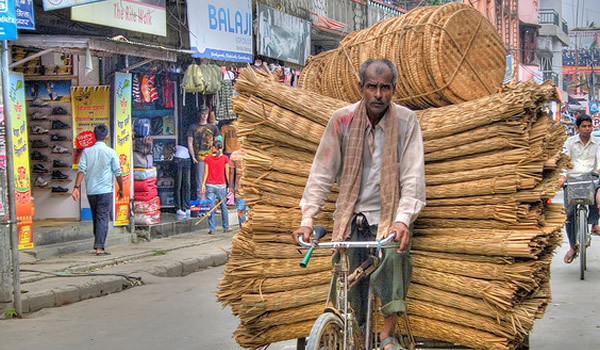 The straw mats, called Sukul, are usually 18 to 20 inch wide and 15 to 20 feet long. Diners are seated according to the family hierarchy, such as the father followed by his eldest son and so forth. The food items in Bhoye are sequentially served to signify the harmony between food and our body. Bhoye starts by laying a leaf plate, called Lapte, in front of each seated guest by servers who are known as Bharin. The plates are handmade by stitching together leaves of Sal (botanical name Shorea Robusta) tree by blunt needle-thin bamboo sticks into a shape of about 14-inch round plate. Bharins start Bhoye by putting Baji (Chiura or beaten rice) on the leaf plates. Next, Achar is put on the plate next to Baji. 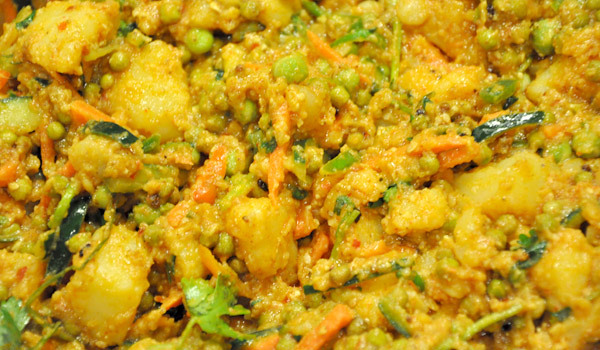 Achar is a salad made by mixing diced boiled potatoes (Aaloo) with small green peas, seasonal root vegetables such as radish, carrot. It is seasoned with ground sesame, chili, lemon juice, oil, turmeric, salt and fried fenugreek seeds. Often, Achar is served in a separate leaf bowl called Bohata, which is 3 to 4 inches bowl made similar to the leaf plate (Nepali Potato Salad Recipe). The third item served is curried stewed of water buffalo meat called Dayakugu Laa. Dayakugu Laa with its gravy is served over the Baji. The rich gravy soaks Baji with its umami flavors as well as softens the crispy Baji. 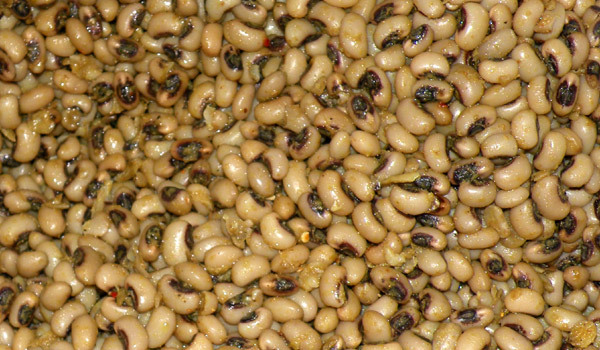 After serving of Dayakugu Laa, guests may begin to eat. 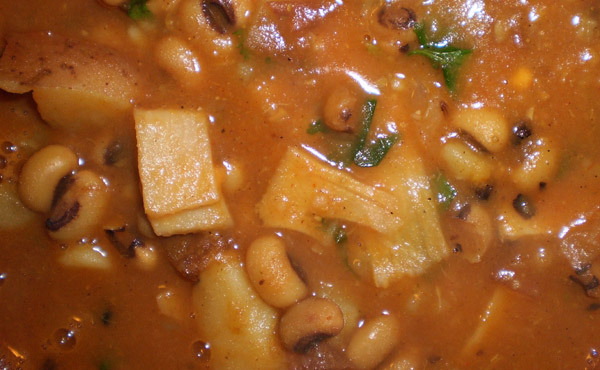 The water buffalo stew is followed by Boo Bo (Geda Gudi or mixed beans), which is served as the fourth item. The Boo Bo consists of three types of beans such as Mee Kegu (Methi Kerau) is a mixture of soaked fenugreek seeds mixed with small green peas simmered in aromatic curry. It is seasoned with garlic, ginger, salt, turmeric, cumin, chili, vegetable oil, and cilantro. Kegu (Kerau or yellow peas) and Simpu (Simi or white beans) are two other beans made in the similar way as Mee Kegu. All three Boo Bo are put on the side of the same leaf plate next to Baji by three different Bharins. 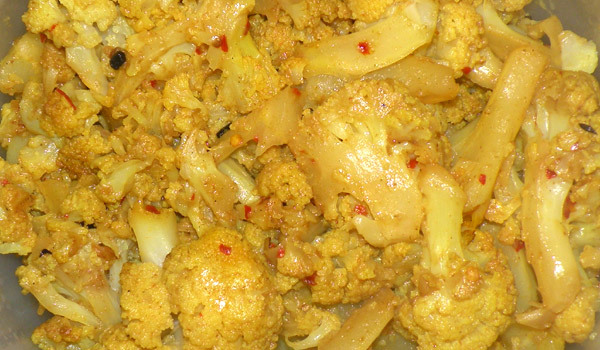 The next item served is a seasonal vegetable curry, usually Kauli (Cauliflower) sautéed with garlic, ginger, salt, turmeric, cumin, chili, oil, cilantro and tomatoes. Immediately after the seasonal vegetable, another Bharin serves Aaloo Chwon (Aaloo Tama). Aaloo Chwon is a stew of potatoes, sour bamboo shoots, and black-eyed peas or green beans. It is seasoned with lots of chili, garlic, ginger, salt, turmeric, cumin, oil, cilantro and tomatoes. 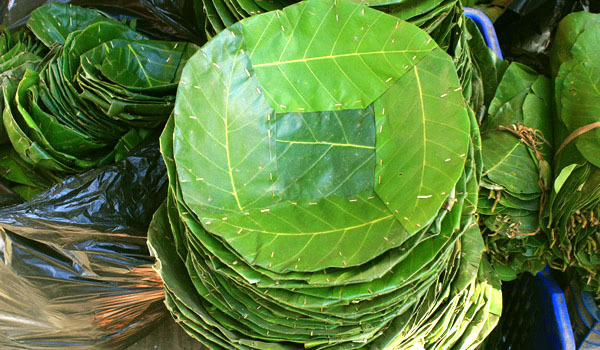 The Aaloo Chwon is often served on a Bhota, the leaf bowl. 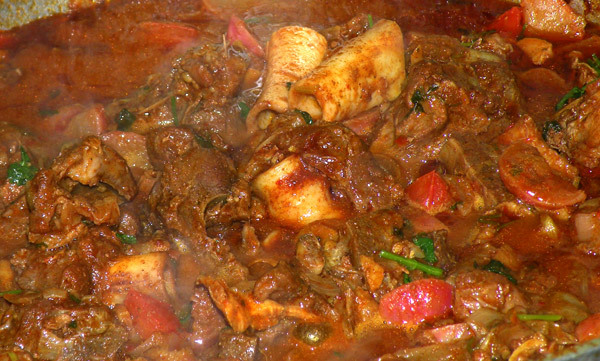 Next Bharin comes with a meat dish called Khashi ya Laa (goat meat) or Kha ya Laa (chicken). These meats are not cultural norm in a typical Bhoye, but serving these meats signifies the higher social and financial status of the host. By this time another Bharin comes to serve Puk Laa (Bhuton), which is fried internal organs of water buffalo seasoned with some spices and salt. After serving of Puk Laa, all Bharins line up to serve a second serving of the dishes, which may continue again. In between the first and second rounds, usually ladies of the host family line up and start to lay Salicha (small earthen bowl) in front of each guest. Salicha is a round clay glass about 2 inches in diameter that is used for serving Ayela (alcohol made of millet or rice) from a special long vase-like container called Aanti. The ladies pour Ayela slowly starting close at Salicha and gradually lifting up to the waist level to aerate the alcohol similar concept as aerating the wines. 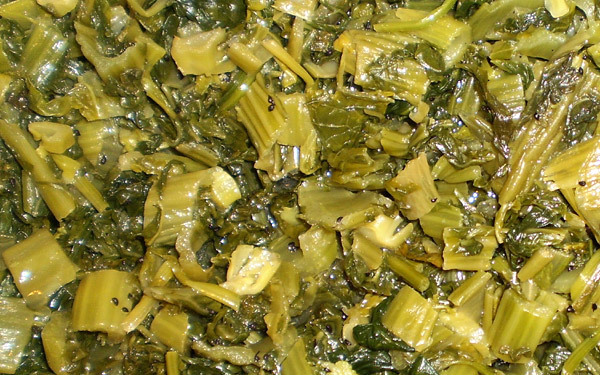 After finishing second servings, Bharins begin serving cooked seasonal green leafy vegetables called Wauncha made usually from spinach or mustard leaves. Immediately after serving leafy vegetable, a sweet and sour soup-like dish called Paun Kwa (Amilo) is given to cleanse the palate. Paun Kwa is served in the empty Bhota previously used for Aaloo Chwon or in empty Salicha that was used for Ayela. Paun Kwa is made of fruit called Aamli (Lapsi – botanical name Choerospondias axillaris ). After serving of Paun Kwa, once again the Bharins come around serving Baji. This time the Baji is meant to be eaten with Dhau (sweet yogurt) as part of dessert. Then the next Bharin starts to serve Dhau. In the end Bharins serve Sisabusa with a pinch of salt. 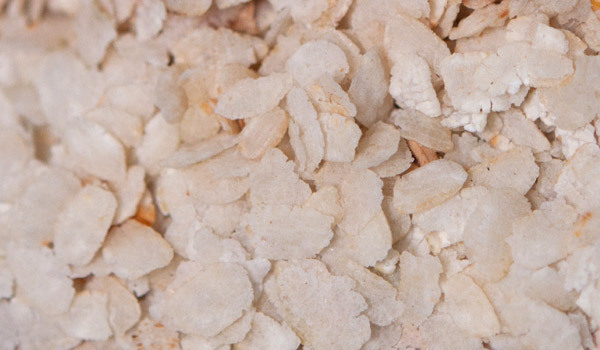 Sisabusa is mixture of vegetables and fruits such as diced carrots, radishes, cucumbers, soaked small green peas, peeled pieces of oranges or any other seasonal fruits and vegetables. After the serving of Sisabusa, the Newah Bhoye officially completes. Despite the completion of the Bhoye, the seated guests do not stand up right after finishing. Everyone waits until the elder member stands up, as a sign of a respect towards the elders. 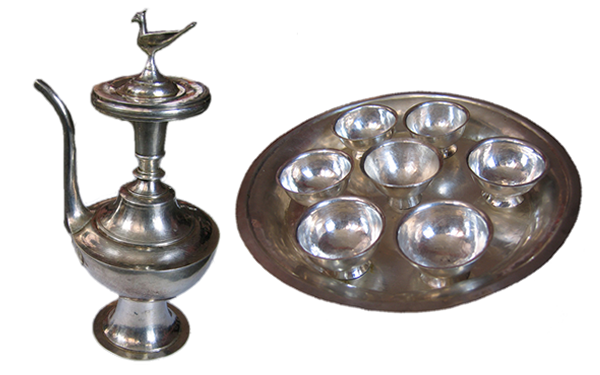 Additionally, depending on the economical status or caste of the host, some tidbits, called Tuchha, are also served prior to the main Bhoye begins. 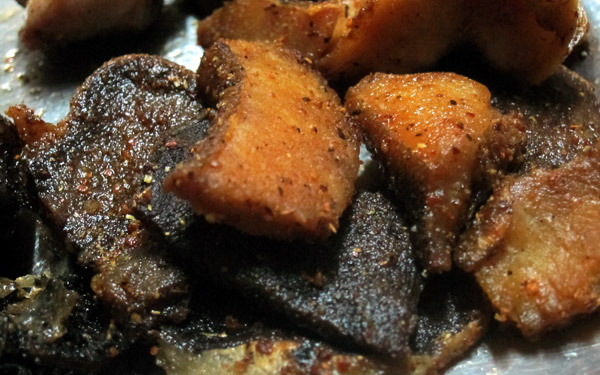 Tuchha may contain pieces of boiled eggs, Chhoyela (grilled water buffalo meat), spiced soybean or black-eyed pea, and a small portion of fried Baji. 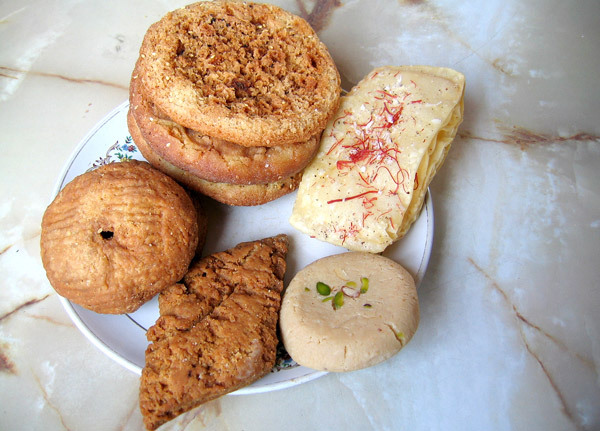 Likewise, especially during the wedding Bhoye, a sweet snack called Lakhamari is also given to the guests as a favor to take home. It is indeed a daunting task to organize a Bhoye for anyone, but some Newah expats are preserving this vibrant Bhoye culture by making part of some festival celebration. I hope my writing about Bhoye would at least inform about this ancient food culture, if not encourage a few to adopt it for their next festivities. This writing was prepared with the assistance of family members Sahana Shrestha in Nepal and Bindesh Shrestha in the United States. A form of this article was published in Laskus magazine 2011 issue. Nice article about Newari Party. It will make everyone hungry. I am also great lover of Newari food. Thanks for using my pictures and putting credit. I am just giving out the link of the picture used here, in-case anyone else needs those pictures. Keep writing more about Newari food, or else it will get lost with burger and pizza….. Thank you for the links Ritesh. We loved the photos of food in your album.